Original name for super glue. Discovered / invented in the 1940s, it was only in the 1950s that it’s commercial potential was realised. It has a range of applications from joining materials to sealing wounds (medical), as seen in the Vietnam war of the 1960s and 70s. Cyanoacrylate is an extremely popular glue and is found in almost every household. Manufactured in a variety of forms, according the materials it is to join. There is a type manufactured for the medical world, for joining / sealing wounds, as a temporary measure. There are other types that are suitable for metals, plastics, ceramics, wood and even textile materials. 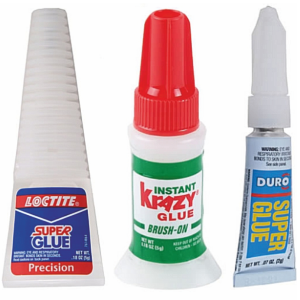 Some super glues are liquid which is helpful when there is a need to allow the glue to flow along a joint line. Other super glues are in a gel form, which means more precise application can be made. It dries so quickly - materials must be lined up accurately before applying the glue. Great care needed, so that ‘fingers’ are not glued together. Super glue can be an irritant if contact is made with skin. Once the tube is open, the remaining glue will last only a few days / weeks. Dries very quickly, no need to clamp materials. A clear substance, leaving little trace on the materials being joined.